Nicotine, the primary addictive compound in tobacco, plays a vital role in the initiation and maintenance of its use. Nicotine exerts its pharmacological roles through nAChRs, which are ligand-gated ion channels consisting of five membrane-spanning subunits. Besides the CHRNA4, CHRNB2, and CHRNA5/A3/B4 cluster on chromosome 15, recent evidence from both GWAS and candidate gene-based association studies has revealed the crucial roles of the CHRNB3/A6 gene cluster on chromosome 8 in ND. These studies demonstrate two distinct loci within this region. The first is tagged by rs13277254, upstream of the CHRNB3 gene, and the other by rs4952, a coding SNP in exon 5 of that gene. Functional studies by genetic manipulation in mice have shown that α6*-nAChRs (where “*” indicates additional subunits), located in the ventral tegmental area (VTA), are of great importance in controlling nicotine self-administration. However, when the α6 subunit is selectively reexpressed in the VTA of the α6−/− mouse by a lentiviral vector, the reinforcing property of nicotine is restored. 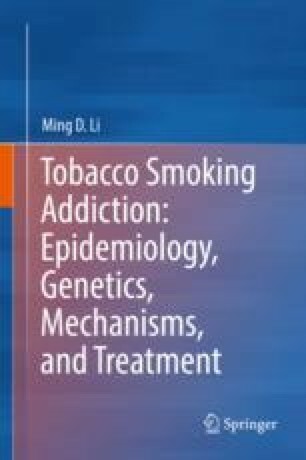 To further determine the role of α6*-nAChRs in the process of nicotine-induced reward and withdrawal, genetic knockin (KI) strains have been examined, which showed that replacement of Leu with Ser in the 9′ residue in the M2 domain of α6 produces nicotine-hypersensitive mice (α6L9′S) with enhanced dopamine release. Moreover, nicotine-induced upregulation may contribute to the pathology of nicotine addiction, although the effect of chronic nicotine exposure on the expression of α6-containing receptors remains to be further investigated. This chapter presents the most recent studies concerning the genetic effects of the CHRNB3/A6 gene cluster in ND. This chapter was modified from the paper published by our group in Translational Psychiatry (Wen et al. 2016, 6:e843). The related contents are reused with the permission.